Royal Navy frigate HMS Portland (F 79) on anti-piracy operations in the Gulf of Aden, in co-ordination with a Spanish maritime patrol aircraft, intercepted two suspicious Somali pirate vessels on June 02. On boarding it was found that both the vessels were having extra barrels of fuel, grappling hooks and a cache of weapons that included rocket-propelled grenades, machine guns and ammunition. 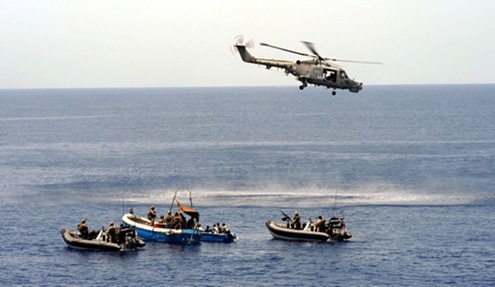 As both vessels were having arms and ammunition, ten people onboard were suspected as pirates. The suspected pirates were disarmed and released as there was no direct evidence to prove them as pirates and to initiate legal action. During the course of operations, one vessel was destroyed and sunk. All weapons were confiscated. View more photographs and read more from the Royal Navy.